I recently purchased these boots during Shopbop’s Friends & Family sale a couple weeks ago. It couldn’t have been better timing, considering we’ve had such gloomy, no-good weather in Dallas as of late. I love these boots because the look is more elevated than the typical rain boot you come across. While I love Hunter boots, the wild colors (red, purple, green) seem a bit impractical for my wardrobe and don’t feel very feminine. I prefer neutrals, whether it’s black or this pretty slate shade I found – luckily Sloosh has both! They design is sophisticated and has a snug fit, which I prefer to the chunky, oversized feel of other rain boots. 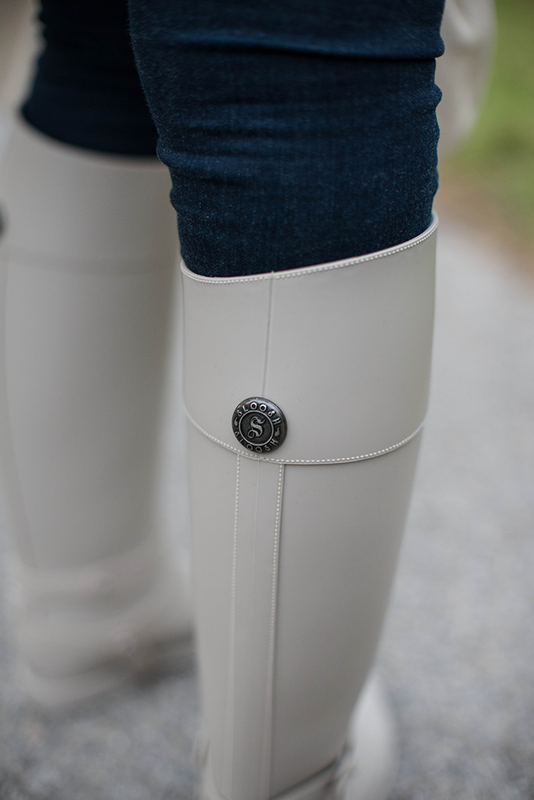 Sloosh boots are sleek and classic, making them wearable for women of all ages. Click here to shop my style and other chic boots from Sloosh! This whole look is perfect from head to toe, I love the trench. Those don’t even look like the “usual” rain boots! I love them and that Burberry coat!! 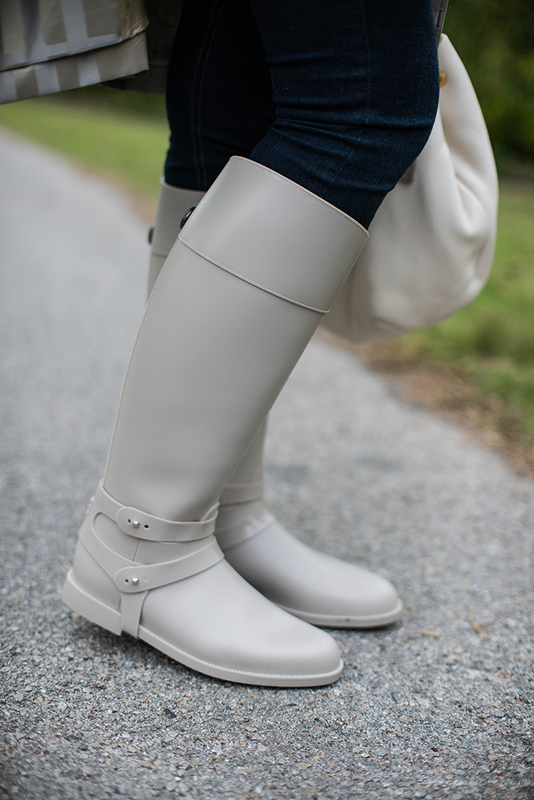 Adorable – love that these are such a sophisticated & unexpected color for rain boots! i love your rain jacket!! Those rain boots are amazing. The color is incredible and it matches perfectly with your jacket. Also, the jacket is gorgeous, I am loving the pattern and class look. Those rain boots are pretty darn amazing. I love the light grey and the detailing! 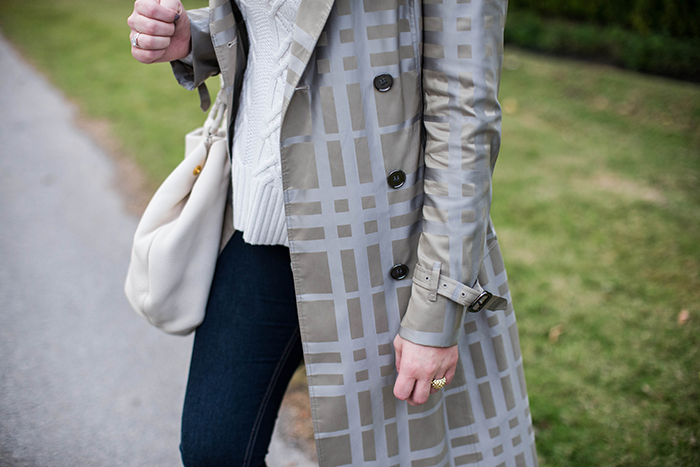 Such a great trench – love the metallic tint! I feel the same way about Hunter boots, so I bought a pair of Loeffler Randall rain boots and I love them! These boots are adorable, Merritt! Loving the neutral color. I love the color of those boots! 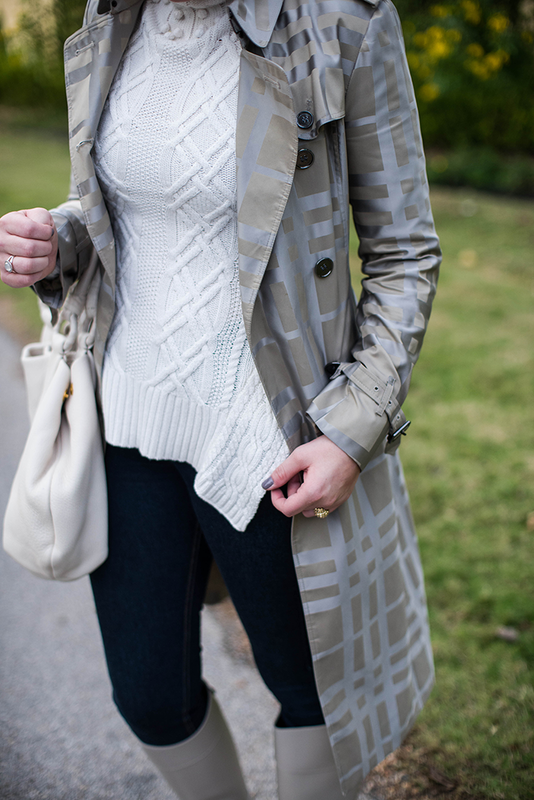 Your rainy day look is cute and cozy! And that coat is gorgeous. these are by FAR the chicest rain boots I’ve ever seen. Love the whole outfit! I never use this work but those boots are chic! Those are some of the chicest rain boots I’ve ever seen!! Love them! omg girl this is great!! adore those earrings and boots! 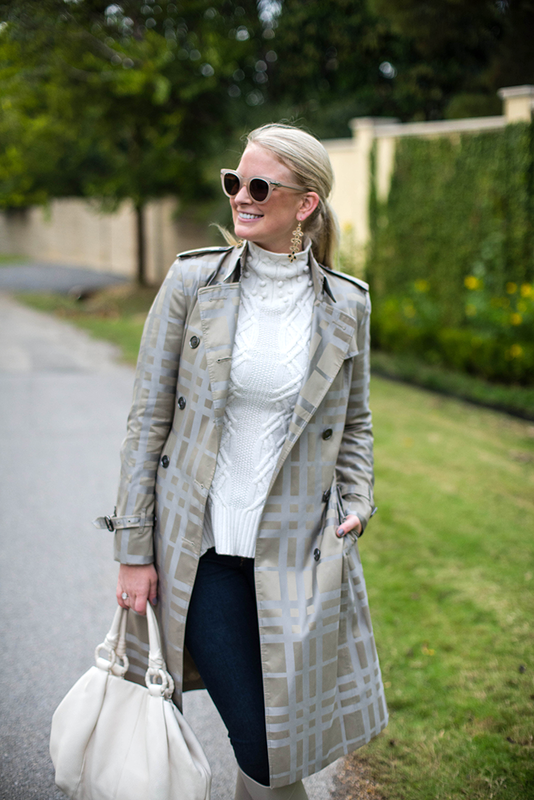 Perfect fall outfit. Love these paired with your trench! And while I love Hunter’s, these are definitely more chic and sophisticated! the boots!! They are so good! and the color really is perfect! your trench is sooo beautiful! The boots are nice ah in the perfect color. You will make any rainy day look brighter with your smile & that head to toe look! That raincoat?! SO cute. Are you *always* so polished?! So impressed. :) Gorgeous!! Definitely prefer these neutral colored boots as opposed to the brighter colors! :) Beautiful!